In this episode, Leomon dies. Just... probably not in the way we expected. As we said at the very beginning, tri. is a very deliberate movie. It moves slowly, chooses its points of emphasis very carefully, and isn't afraid to burn an entire episode on development or even pure fun. The climax of Determination has enough action, suspense and surprise to make you forget this. There's a kidnapping, a fight with some new evolutions, a dramatic redemption, and a shocking twist. It's a brilliant conclusion, but take any of those at face value and you'll miss everything. 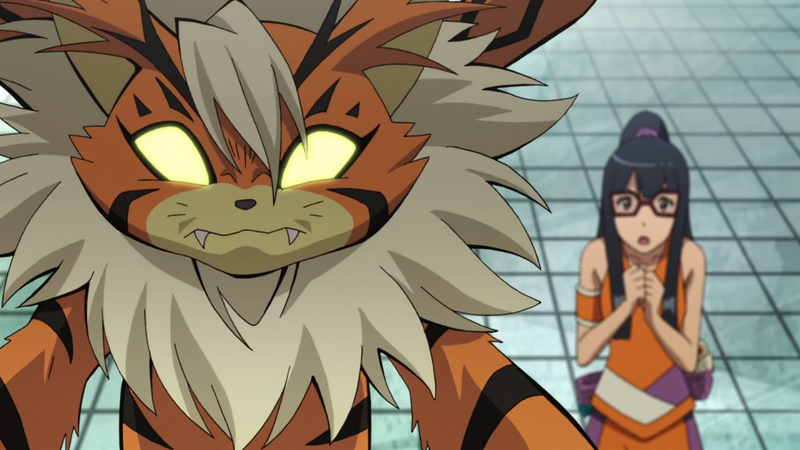 Meicoomon wanders off for the third time in the movie, and Maki's failure to take care of her leads to the abduction. Maki, Mimi, Takeru, and Hikari all identify the culprit as Ken Ichijouji, back in his old Kaiser threads. Considering that none of the digidestined have acknowledged the 02 cast in any way, this is alarming in its own right. The reactions range from confusion to anger to horror, and you can even wonder about the ways they address him. It does narrow the possibilities down as they obviously do remember him (and for once are even able to identify him in his Kaiser outfit! ), but trying to piece together where they stand with Ken and how much they know remains a puzzle. Determination doesn't answer as much as we'd hoped on this end, but it is a development and the undeniable acknowledgment is almost as satisfying. No matter what they call him, nothing about either this Kaiser or the strange pocket dimension he pulls Meicoomon into is natural. 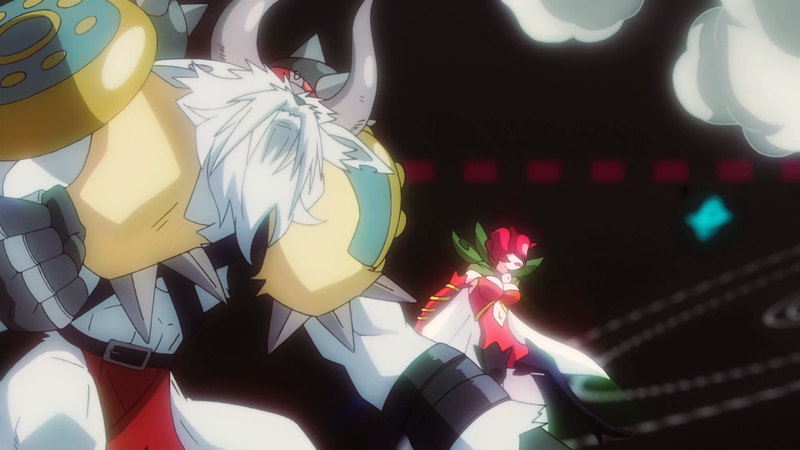 The Imperialdramon that appears finally serves up some good action as Gomamon and Palmon get the full evolution spread, delivering us Vikemon and Rosemon for the first time. Exciting a climax as that is, as Koushiro points out, it's another mystery. So is the Kaiser's willingness to simply release Meicoomon upon Imperialdramon's defeat. He (“it” may be more appropriate here) had more than enough time to get out of there (assuming he could actually take her with him), but instead smiled and happily returned the suddenly panicked Meicoomon. We have to think there was a point to the fight, but calling it a simple rescue effort is premature. Vikemon and Rosemon don't appear if Joe doesn't finally show up to the fight. It takes a broken bike chain and a stern talking to from Hikari to make it happen. Like Taichi, it's not clear that he actually gets his act together. He has all these questions about why he is a digidestined and why he's still asked to be one, and these questions overwhelm his thinking to the point where he drives Gomamon to tears arguing about it. Hikari's method of getting him to turn around is to get him to stop thinking. Regardless of the why, Joe knows he has a special bond with Gomamon and he will always act to keep his partner alive. That doesn't mean the questions will go away the next time he gets the chance to opt out of a battle. He still probably believes growing up is best for him while Gomamon still insists on fighting. Just because he'll fight to keep his partner alive doesn't mean this has been reconciled. Despite all the questions, everybody looked like they were going to get out of it in one piece. Imperialdramon was defeated, Meicoomon was released, and Leomon fought off a possible infection to get her, Pukamon and Tanemon home safely. That's when everything goes to hell: Meicoomon has a vision of infected Leoomon and freaks out, Meiko's digivice turns black with a weird helix pattern on the display, Meicoomon either evolves or goes dark, Leomon becomes another statistic, and to everyone's horror Meicoomon jumps back into the darkness- wandering off yet again. As the new girl learns that emotional devastation is part of the digidestined initiation process, Maki smiles and walks away. Calling her and her agency villainous over one smirk is too presumptive (and would be horribly telegraphed), but her lack of concern about the situation is still disturbing. Whether she's happy that Meicoomon is realizing her potential, that her theories about Meicoomon being the source of the infections are confirmed, or that tri. finally has a promising plot development, Maki has a big picture outlook. She values the digidestined as knights in her battle, but a chess player is willing to sacrifice a knight under the right circumstances. You know what's not a big picture outlook? The Digimon being terribly disobedient and entering a costume contest and Meiko being excited about her partner winning and Yamato thinking Gabumon deserved it more. This is why we love these kids. Takeru and Hikari watch both Yamato's concert and Taichi playing soccer. It's not as big a deal as a gig at an actual music venue or a competitive game, but it's nice that they have an audience now. While we're asking questions about this mysterious dimension, who's controlling who gets in and out?What allowed Palmon, Gomamon and Leomon and only those three in? Was that a mistake that interrupted a clean getaway or a deliberate move? Perhaps the big question is this: whoever's controlling this sort of stuff- has anything gone wrong for them yet? The Kaiser's smile never let up. As big a deal as it is seeing the Kaiser again, he's always associated as a villain in that get-up. Hikari wonders about Imperialdramon as well, somebody who has always been on their side. Labels: Joe, Leomon, Maki, Meicoomon, movie, tri. I agree 100% with your take on Joe's atitude in this episode. In fact, I found it similar to what happened to Taichi last movie: both boys were backed into a corner and made themselves swallow their issues and fight, for the ones they cared about: the former, Gomamon, the latter, Yamato. In both cases, it was good enough for that specific moment. We know now that Taichi still has doubts and, in my opinion, the harder he conceals then, the bigger problem they get. Joe seemed to be much more confident during Ketsui's climax that Taichi seemed during Saikai's, but We'll have to wait for the next movie to see where Joe stands. I'm still not convinced that was really Ken, especially since he just vanished in thin air after the Battle with Imperialdramon. It could've been a copy, like what they tried to do with Sora. Also, for all they know, the kids killed two of their friends Digimon partners and didn't even bat an eye. In the end, we're left with the same unanswered questions from Saikai, which frustrates me a lot. The good news is that now they'll have to adress what happened to the 02 cast. The bad news is We'll have to wait 6 months for the next movie.